1984: Infirmiere diplomee in soins generaus. Croix Rouge Suisse (Berne) 2011-2012: Master Degree in “Ethics Nursing”. Valencia University. I've worked for several years at the Cantonal Hospital (Geneva), Neonatal Intensive care, Sondureta Hospital. (Palma de Mallorca). Oncology and transplants pediatric unit. Hospital Universitario y Politécnico “LA FE” for the last 20 years. Active member of the National and international nurses group ( GEET, EBMT, SEEO and EONS). 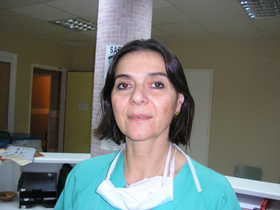 Involved in several nurses training course in Spain and abroad. Volunteer nurse at Barretstown (Ireland) since 2009.